2) Nakajima is just about my favorite guy. I know the Nakamura comparisons are too easy. I know. And yet... he's the prodigy that was always just a bit too bland to be loved, got a weird haircut, became sleazy, and discovered a deep well of elitist scumbag charisma. This part made me seek out the match and Nakajima looks so rad now. Gives off a real LIJ vibe. Not sure about Kiyomiya's semi-tribute act or his tragic young boy soul patch, but this a good match worth checking out. Fun match, but I'm also not sure about Kaito's tribute act. It is easy to fail when you are trying to ape one of the GOATs. Tokyo Sports 2018 Awards are out. Naito winning the technical award doesn’t make any sense to me, considering his style and the in-ring year he’s had. But he’s too big of a star to giving nothing to, I guess. And getting back to NOAH: Sugiura deserves the performance award way more than Marafuji. Wonder if Kaito will win the GHC HW. He will be the youngest to wear it if he wins. Kind of surprised Fujimoto won the joshi award, but I haven't paid attention to Ice Ribbon in a long while. Figured it would be a Stardom talent or TJPW talent if anyone won. Utami taking the rookie award is no surprise with the big push she has been given. Sabre should have won technical, Naito barely even wrestles a technical style. It's more of a mish-mash of things. From that awards list I don't entirely understand what are the differences between MVP, Outstanding performance, Fighting Spirit and technical. To me they all kinda sound like "we can't give you MVP, but you totally should be on this list so have this". I'd have gone with Kazuchika Okada for MVP. The right match won MOTY. It's a cover of who's getting profiled. I'm assuming Okada/Omega, Okada/Tana (all of them), and Ibushi/Tana will top most of these lists, so I'm essentially allowing everything else. So, not terribly obscure, but my pick would be Sugiura's GHC defense against Nakajima, though all the former's defenses (and his win over Kenoh) deserve mentioning. I'll only allow myself one explicit "runner up" mention for Ishii/Ibushi (my most-watched match, and probably my favorite--please don't ask how that differs from "best"), which I think will get lost in the G1 glut and bigger matches both guys had. Otherwise, I deleted all the other stuff I mentioned, because choosing everything is choosing nothing. How dare you not include Omega vs. Ishii in your list of the obvious candidates. I thought I knew your rasslin' taste. Kinda shocked they’re going right to this. It's his rival and nothing they book is traditional. I can't imagine that match being tamer than their last one, which made me wince way too much. 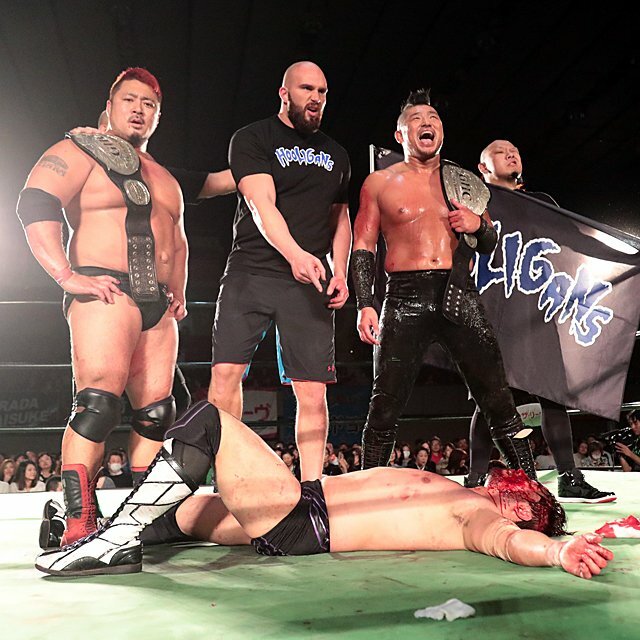 It's great to see NOAH, AJPW, and obviously NJPW loaded with talent and trending in a positive direction when it looked like the former was about to shut down not that long ago and AJPW was a sinking ship. My body is ready for another golden age of Japanese wrestling (which NJPW is already in). What the hell does NJPW have to do to get more time on Asahi and not in a graveyard time slot? It's so weird that World Pro Wrestling would air so late and they cut All Japan's TV in the early-to-mid '90s when business was still either super hot or even better than the '80s at least in terms of ticket sales. That they’re such natural rivals is why it strikes me as... soon. Like neither guy should lose. Surly kick-man, a kinda flabby 5’7 junior who worked his way up from Michinoku Pro and rejects NOAH’s nostalgia versus the chiseled chosen babyfaced prodigy who literally wears that past and openly idolizes it. It’s great! And there are other big defenses too: Shiozaki, who sorta failed when trying to be the next Kobashi; and Marafuji, who is Marafuji. And I’ll be needing an Akiyama challenge too, the man who beat the real Misawa for that very belt. But if Kenoh is the antagonist for the next few years... well, I guess we’ll see. It is certainly cool to feel invested again.